DISTRITO MAKATI is back!!! - Hello! Welcome to my blog! 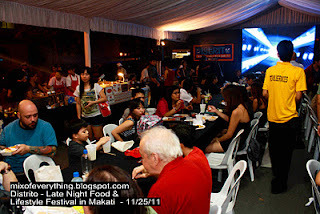 Announcing.... Distrito Night Food Market in Makati is back for a 2-month run starting June 1, 2012 Friday until July 27, 2012, Friday. Who's excited?? I know I am along with other people in the area and the foodies nearby and also from the vendors to bring back this market in Makati after its successful run last December. And I just say from Distrito's page that they are happy to be back to provide late night food and entertainment to the premier city of Makati! For inquiries on how to join the DISTRITO, feel free to email us at admin@distritomakati.com or text +63 917 840-1152. Slots are prioritized and limited. DISTRITO Market in Makati is Back! Do check out my posts about Distrito Makati below. For more information, please visit Facebook.com/DistritoMakati or follow us in twitter @DistritoMakati.